"The advanced suspension technology found in our dampers is derived from successes in World Challenge, Redline Time Attack, Formula Drift, One Lap of America, NASA Racing Series, along with being the official suspension supplier of Global Time Attack." Lol shock dyno results. Most of you wouldn't even know how to apply the data to how the car is going to work. Ahh. I should have been more specific: results on track (lap times, for which I'm fine with FA) and, in the case of OP, street manners (Ohlins owns). Being the "official" whatever of a race series means you sponsor the race series. IE- give the series money and give out contingency prizes. 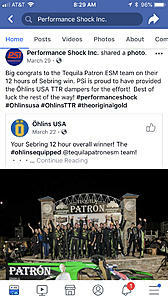 If you wanna bring up racing credentials, I think Ohlins has that on lock. The rebuild price has jumped up considerably in the past 6 months. I had my FA coilovers rebuild a year ago and it cost 50 or so per corner. Low 200's. Now the cost of getting them all rebuilt cost 600 dollars now... One of the main reasons I went with FA was the low cost rebuild service but now being so high, I would've went ohlins or something since it'll probably cost the same for rebuilds. Build a client base with introductory rates ,establish a name, then raise prices. Bummer. Rebuild cost was 50% the reason I was considering FA. The way to win any girl's heart. Im not arguing racing credentials, or even which coilover or manufacturer is "better" in general. Im defending FA on the basis of best bang for your buck which is what the OP is looking for. If FA500 is 8.5/10 and Ohlins is 10/10 I dont see how that extra 1.5/10 is worth another $800+ in the context of bang for your buck. Sounds like you haven't driven on both in order to come to that conclusion. This. Ohlins have insanely good street manners.